From Ice Age animals to Native Americans to early pioneers, Pine Island Conservation Area has a rich history. Mastodon tusks, pottery sherds, and 19th century farm tools found on site help piece together the story of this special place. 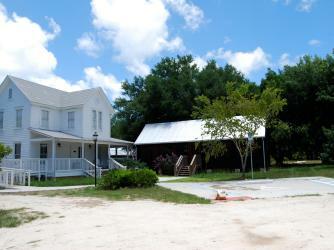 Come inside the oldest standing home in Brevard County, the 1875 Sams family cabin. Travel back in time here and along the paved trail where interactive exhibits highlight Pine Island's many past inhabitants. Enjoy hiking, biking, horseback riding, fishing, canoeing, and kayaking through five different habitats and over six miles of trails. Wading birds, bald eagles, alligators, manatees, and bobcats are just a few of the animals that you may see. The Environmentally Endangered Lands Program and the St. Johns River Water Management District jointly own this over ​880-acre site.